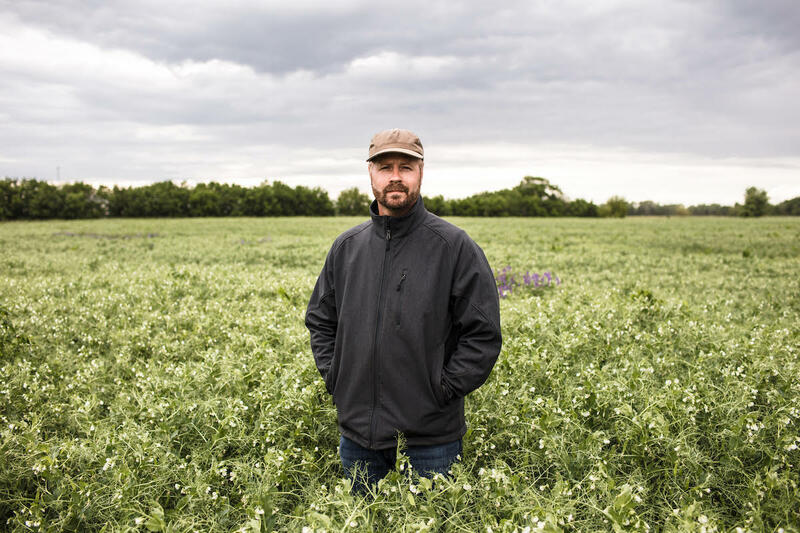 Join Wichita entrepreneur and farmer Clint Brauer as he sets out to change organic farming, starting with herbicidal robotics that would eliminate herbicides and tilling. For the next 10 weeks, Clint Brauer, farmer and founder of Greenfield Robotics, an agriculture robotics startup focused on creating herbicide robots for no-till, organic row crops, will be sharing stories, photos and videos from his life as a Wichita-area entrepreneur. Join Clint as he shares the ups and downs of running a startup in Wichita while simulataneously operating an active farm. Chances are, you’re aware of the differences between organic and conventional foods — the most notable of which is the price. That’s because organic farming takes a lot more time, care and fewer chemicals and processes, on which farmers typically rely to get a successful crop. One of those nifty chemicals is herbicide, which helps kill weeds without killing the crops. Most organic farms opt for natural herbicides or tilling, which breaks up the dirt to prevent weeds from growing and killing crops. Tilling has consequences, including increased run-off and the disruption of root patterns that can negatively affect the crops. Clint believes he might have a solution through Greenfield Robotics, which focuses on robots that can kill weeds between crop rows without tilling and without the use of herbicides. We sat down with Clint to ask some questions about what it takes to get a business off the ground while at the same time managing an active farm. You will be hearing more from Clint as he works toward a future where row crop farmers no longer have to choose between harmful herbicides or tilling. Could you start by talking a little bit about yourself and your business? I am on a mission to drive harmful chemicals out of food production. This process started with the formation of my farm, MG Honor Farms, which has served as a laboratory for testing production methods and marketing. Through that process, we taught ourselves how to raise vegetable crops, both indoor and outdoors, without synthetic fertilizers, pest controls and weed controls. However, current weed control methods for broadacre crops, such as corn, soybeans and milo are unacceptable. Greenfield Robotics was created to solve the weed control problem for broadacre crops and, eventually, solve many existing problems in food production. What is your background like? I grew up in Haven, Kansas. Luckily, I was surrounded by the most brilliant class ever to graduate from that small, 4A school (we were told). Being around such a creative, talented group of people really set the stage for high expectations of what was possible. I subsequently earned two degrees from Kansas State University and immediately moved to Los Angeles to break into the technology field. I begged my way into one of the first web development firms in the country, w3-design which became USWeb and went public. I loved that job and the people that worked there. From there, I engaged with countless startups, was employed by some of them and had executive roles at various companies, including Sony. At Sony, I was probably the first person in the world to integrate together SaaS (software as a service) systems such as Omniture, RightNow, Post Future, e-commerce systems and then use statistical methods on top of that data to drive decision making across our call centers and online/offline marketing campaigns. Along the way, I also helped launch the first Sony eBook reader in the US and learned why big corporations sometimes fail in new markets. That’s a pretty exciting background. What brought you back to Kansas? I came back here to decide what was next after a divorce. After some time, I decided it was important to be around my parents as they aged, follow my renewed faith and strive for a long-term positive impact on society. My job here is much more complex, but my life is much simpler. The farm has robbed me of a good eight years of time being social but, thanks to Josh Oeding at e2e, I’m starting to find more like-minded folks in Wichita. About nine years ago, I met Gina, my significant other, which has been the best part of being here. I still get a real kick out of spending time with her. She excels where I do not. For example, she teaches dance of all types in Wichita. I am pretty bad at dancing, especially when celebrating a business victory. What brought you to farming and, eventually, robotics? Growing up, while my friends hit the pool during the summer, my dad and I were out fixing old equipment and trying to hit weather-imposed deadlines. I kind of hated farming back then. My drive to escape that life helped me excel at K-State and then in my career. However, I pushed too hard and, at age 25, developed some health problems. The doctors started scripting pills, which made me nervous. Luckily, my boss at the time, Peter Anton, was really into healthy eating and organic food. He got me on track, and I developed a curiosity about organic food production methods at that time. Upon my return to Kansas, it started to dawn on me that the Wichita area had not yet adopted the local and organic movements, so I started raising vegetables and built a greenhouse after a couple of years. Over time, I learned the limitations of various production methods, the incredible financial and health risks farmers endure and the impact our behavior has on human and environmental health. So Greenfield Robotics was made to confront some of those problems. What impact could this type of technology have on sustainable organic farming? Well, I believe our farm is unique in that we operate across many categories of farming including veggies and herbs, broadacre crops and now proteins. We’re somewhat versed in conventional, organic, no-till, tilled and intensive grazing techniques. We also raise some crops that are not common in this area, such as yellow field peas and pearl millet for grain. I’ve learned enough to know that the opportunity for robotics across all those business lines is massive. While we are starting with weed control in broadacre crops, that’s just the tip of the iceberg. Given that I help drive forward the creation of a chemical-free vertical supply chain for Canidae Pet Foods, we have a ready-made market for our robotics and techniques. At the same time, we can provide growers with a path to consistent, improved margins and a bridge to chemical-free farming. So how did you know this idea was worth pursuing? Well, I came up with the idea a few years ago when I realized no existing methods would suffice. Other robotics startups had an approach that was very high-risk and probably would not work for my methods of farming, which align with consumer trends and farm production method trends. So at that point, it was about validation if such a machine could actually be made and work. For that, I got in touch with an old friend and co-worker from my w3-design days, Steven Genter, who had spent the past decade creating a machine vision software called RoboRealm. Over lunch, Steven said, "I am presented with a lot of ideas that are unachievable given current tech constraints, but this one could be done.” That was enough for me given my past experience working with Steven. From there, he put me back in touch with another past co-worker, Carl Sutter, and the three of us began work on Greenfield Robotics last year. Steven and Carl were part of a telegardening project featured on the front page of The London Times in the mid-’90s. I believe they were the first team to conduct tele-operations of robotics over the internet. At w3-design, we had an internet-controlled car with Java applets streaming video running around our office. That was in 1997. Think about that for a moment. Carl and Steven have been carrying out tele-operations of robotics and other devices since the ’90s. Now that the business is up and running, what does your typical day look like? Let me break it down into buckets. When it comes to capital, I’m working on finding sources of capital through friends, family and business contacts. I’m also following up and closing on those leads, creating various presentations and presenting. We’re also always applying to various contest and programs for capital raise. This alone is a full day for most folks with a regular job. On our product, we’re constantly reviewing ideas, mockups, technologies and competitors with Carl and Steven providing feedback. We’re also testing prototypes in fields to help define what farmers accept and what they will not. Again, a full day’s job. We’re also constantly identifying future and next-gen products. When it comes to marketing and sales, I’m having conversations with farmers, presenting at farm events and learning about challenges farmers face that might be different from my own. Informally, I’m assessing points of resistance in the market. I’m also formulating a plan for potential crowdfunding. I also have a lot of legal, financial and administrative tasks, including filing forms, creating contracts and tracking expenses. With Canidae Farms and MG Honor Farms, I’m recruiting farmers to our production network, managing logistics of our field crop production and equipment maintenance and doing farm program paperwork. I’m constantly trying to learn more about production techniques, including cover crops, intensive grazing, animal husbandry, non-chemical pest controls, etc. I’m also currently training our greenhouse and veggie lead. I continue to hand off more responsibility to her. I also personally deliver vegetables to our longstanding customers in Wichita, a task I enjoy. There is a pretty great relationship between what we are doing with the farms and Greenfield Robotics. Finally, my personal time. I spend as much time as possible with Gina, my parents and siblings. I talk with friends and try not to bring up business. I also continue to make visible improvements to our farm, and I read and study. There are several types of startups, but I tend to be involved in those that create something new that has not existed and has the potential to scale and be a change agent on a global scale. Unlike in a franchise or small business startup, there isn’t a playbook or a model that can be mimicked. That means the risk is higher, but so is the reward for both founders and investors. To me, an entrepreneur is someone who takes a lot of personal, financial and career risk based on a vision of some future state. By those definitions, would you consider Greenfield Robotics a startup in its current state? Yes. It is the epitome of a startup as described above. What have you learned so far from this process of starting a business? The mechanics of starting a business have improved. State governments are doing more online. Services exist for pitch deck design, payroll, video editing, etc. You can make it further without an admin. What’s next for the business — where do you hope to go from here? Up and to the right. Seriously, though, we are working on our fourth and fifth prototypes, which will operate over the internet this summer. We are also adding up to 10 farms this summer to test how these prototypes perform on corn, soy, milo and potentially for hemp farmers in South Central Kansas, Northeastern Colorado and Southwestern Nebraska. And, as always, we’re continuing to raise funds from accredited investors. Once we better prove our product this summer in fields, we are headed toward a bigger raise in the fall from investment groups and/or family offices. What advantages and disadvantages are there to starting a venture here in Wichita? Advantages are a low burn rate given the low cost of living. Generally speaking, disadvantages are access to capital and a mindset here that values a “good job” over risk-taking. Josh Oeding and Trish Brasted are working on the capital problem and deserve our support. Hopefully, a mindset shift will also take place. What do you think could be done to improve on Wichita’s startup scene? An injection of optimism. A celebration of the wins. The support of local media. A realization that everyone fails at least once. Angel investors also need to be brought together to be incentivized to invest and, again, folks need to support e2e. The Kansas Angel Tax Credit helps, but we don’t see that same support from the city and surrounding area. Where do you hope to end up, and what do you hope Greenfield Robotics accomplishes? Greenfield Robotics is an enabler of a roadmap for farmers to reduce chemical usage and return farming to less variable revenue, costs and margins. I have about 20 years to work alongside others to make this happen across all food production. Startup Diaries delves into the lives of Wichita entrepreneurs as they do everything they can to grow their businesses. For the next 10 weeks, Clint will update us on his business and his journey. If you, as a reader, have questions for him, reach out to The Chung Report via social media or our contact page.